SC: The idea started when I got a book of ads in the mail - we're talking about two hundred pages, full color, hard cover, all ads for companies that do visual design works. The original idea was a furry version of that. RG: So adverts of various furry artists? SC: Yup. The reason I didn't act on it at the time, well, reasons, is that I hardly knew anyone at the time, and I lacked a lot of the basic knowledge to pull a project like that off. RG: You said the idea has gone through a lot of changes though so what exactly is the current Anthroview going to contain? SC: It'll still have the same basic idea; a showcase of work done by the fandom. This incarnation was also inspired by old U.S. science fiction magazines from the 1950s and 60s, which were a mix of stories, articles, and reviews. RG: Will this all be new content or will it be a collection of items already available online? SC: New content, actually, and exclusive for a month after release. Content, except where volunteered as an exception, is being paid for. RG: And I understand there is a cost to Anthroview as well. SC: Right now, I'm planning to sell hard copies at $4.00 (USD), and e-copies at $2. Any (gross) income from Issue 0 will go towards Issue 1. RG: Furry content is generally free. There's no shortage of art sites, forums and news sites available at no cost. You've said Anthroview content is only exclusive for one month. Why would people want to pay for it? SC: To help support the authors and artists involved. 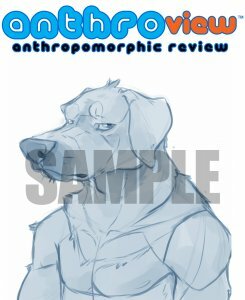 I sell art prints at conventions, of art already available for free on Fur Affinity. I'm really just applying the same principle here. RG: Speaking of conventions, I believe you're planning to release the first issue at Antheria and the second at Further Confusion. SC: That is correct. I was originally shooting for a release at Califur, but that fell through. RG: How frequently will Anthroview be published then? Will it have it's own schedule or is it going to be tailored to fit with various conventions? SC: Unless I see a large enough demand, I'd probably stick to conventions as release dates. The ones I'd be selling at happen to fall roughly into quarters, anyhow. RG: If one couldn't make it to one of those conventions, how would they get hold of a copy? SC: I've got a Google Checkout set up for orders, I just need to update the website. I can sell an unlimited number of e-copies (Primarily PDF), and a limited number of hard copies. RG: If one wanted to get involved, submitting content or just helping out how, would they go about doing that? And on a similar note do you have any high-profile furs submitting to this first issue? SC: Getting involved is as simple as contacting me about it, via email or FA. As for who is submitting in this issue, I've got a few people well known on FA's forums, e-w01f on FA working with me for art, as well as some items from other artists. RG: I understand you were also involved in another furry magazine project, Rowrbrazzle. How were you involved in that or are you still involved with it? SC: I was involved in Rowrbrazzle for a year, as a writer. THAT was an awesome experience; Rowrbrazzle is older than I am. RG: Has that experience proved useful in setting up Anthroview? SC: In all honesty, not really. An APA [RG: amateur press association] is members only, mostly to gain advice from other members. If I was writing stories for Anthroview, it would help; but I'm trying to avoid that. RG: This isn't the only aspect of the furry fandom in which you are involved or have been involved. What all else do you do for the fandom? SC: For several years I've been staff at Califur; I've volunteered constantly at FC. I also help administrate Fur Affinity. RG: Quite impressive. Finally, do you have any future furry projects planned? SC: I do. Another project that's adult orientated; as well as a few service-based websites. On a less financial side, I am nearly done with a card game project that is furry-fantasy orientated, codenamed Kazakastango!. RG: Any idea when we'll be seeing any of those? SC: The adult project, I'm shooting for a FC release. The services are hard to say, as I'm solely providing the funding and leadership, not the technical skill. The card game has run into a snag on mechanics in play-testing, and needs some reworking, but I can start making random cards for people at any time.